This old surname, is of North German origins. In its earliest form it is always found as Hester or Heister, but from the late middle ages, it adopted several spellings, see below. It is believed that the name is job descriptive, and equivalent to the English 'Crier or Cryer', in other words it may describe an officer of the civil authority who made public announcements. However it may also be a nickname for somebody who in someway resembled such an official, or even acted the part in the popular medieval theatres. 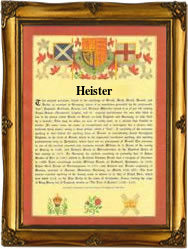 What is certain is that the name has a long and honourable history, being well recorded in the spellings of Hester, Hestor, Heister, Hesterman, Heistermann, and the Dutch Van Hesteren or Hesteren. 'van' does not always mean 'from', it is often applied to surnames as a patronymic similar to the gaelic 'Mac'. The surname is also recorded in the early registers of the new United States of America, Eziekiel Hesterns, an 'anglicised' spelling, being a witness at Albany Lutheran Church, Albany, New York, on April 19th 1796. Early recordings include Ludwig Heistermann of Marburg, Germany, in 1586, whilst Daviot Hesters, the son of Hermann and Magdalena Hesters is recorded in Amsterdam on February 24th 1609. Another recording showing the Dutch influence is that of Albertina Van Hesteren, christened at Kuilenberg, Gelderland, The Netherlands, on August 20th 1761. A coat of arms associated with the surname has the blazon of an oak tree proper on a white field, overall two black pales. The first recorded spelling of the family name is shown to be that of Heinrich Hester, which was dated 1403, the charters of 'Eiche oder Buche', Germany, during the reign of Emperor Rupert of the Palatinate, 1400 - 1410. Surnames became necessary when governments introduced personal taxation. In England this was known as Poll Tax. Throughout the centuries, surnames in every country have continued to "develop" often leading to astonishing variants of the original spelling.